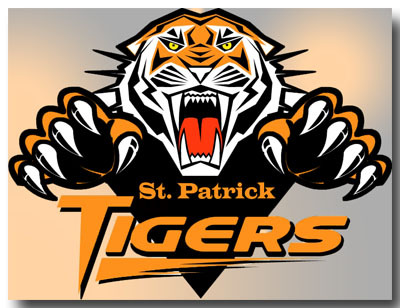 Welcome to the home of the St. Patrick's Tigers of Sacramento, California. We are a member of the Girl's Parochial Athletic League, which contains 36 teams from the Sacramento Catholic Diocese. Our goal is to be competitive at all times while building on our Catholic faith through hard work and determination. We have a long and proud history of producing Division and Parochial Athletic League Champions. And we will push ourselves to beyond the limits to keep this tradition going. So watch out world, here come the Tigers!!!!!! Another season has passed and another outstanding year of St. Patricks Basketball. All of you have done outstanding this year. To finish the season 23-4 really says something about how hard all of you have worked this season. I am so very proud of each and everyone of you. So I just wanted to say thank you to my 7th graders, Crista, Alyscia, Tiffany, and Tracey. And I wanted to say thank you to my 8th grader Nadine, Jessica, Alexis, Sarah, Breanna, Christina and Samantha for not only working so hard this year but for all the years we have been together, with a majority being with me from Kindergarten, Mighty Midgets, Varsity Softball, and Varsity Basketball. I am really going to miss all of you. Please take care of yourselves and always stay in touch. Take care everyone. Another great job ladies. What a tournament. 24 teams and 3rd place, you should be very proud of yourselves. Only two baskets kept us from that championship game. That says a lot about the competition. And congratulations to Samantha for being selected for the All Tournament Team. Great job Samantha and great job everyone. Well that's it for tournaments for us until the TOC's. You have done an outstanding job. Now all I have to ask is "How far do you want to go!?!?!" Congratulations everyone on a great 2nd place finish in a talent loaded tournament. This was definitely the toughest one we've been in so far. You played hard throughout and played your heart out in this four day tournament. Every game was a battle and you showed that you have great desire and heart. Again great job everyone and congratulations Christina for being selected to the All Tournament Team. Thanks everyone. Nice way to finish it up ladies. Both teams came out tough in the first period, but as usual, you picked up the intensity on both ends of the court allowing them to score only 6 points in the final 3 periods while you scored 33 points. Well, the fist game of the regular season is this Friday. Let's work hard and keep our intensity level up and be ready to work hard the rest of the week. Take care everyone. What a way to end Christmas break. You scored in double digits in every period and made some outstanding outside shots. This game showed the level of play that this team can rise to. You never let up on your opponent, staying aggressive until the last buzzer. And as usual, this was another outstanding team effort, either by scoring or playing defense. Next week we have two games, including the league opener. So let's take what we've learned this pre-season and take it into January and February. Again, great job everyone. And thanks again for all your hard work. Great job. I can't say enough about the balanced attack we have. That first half was very impressive, allowing St. Elizabeth to score only 2 points. What a way to finish up the pre-Christmas season. We have three practices during the break which should give us time to rest all those nagging injuries we've been experiencing. Remember, the first Tuesday back we have a game against St. Mels. They're always a very tough opponent. So keep yourselves primed and ready to go. Take care everyone. I would strongly encourage everyone to lightly work out on off days just to keep your skills up by shooting around and doing some short jogs. If you have any questions, please let me know. Great balanced attack everyone. Contributions were made by everyone. One important factor was our defense. We didn't allow any points to be scored in the 2nd half, which says a great deal about how hard everyone worked. We have one more pre-season game before the Christmas break against St. Elizabeth. Let's work hard in our preparation. Thanks again for all you hard work ladies. Congratulations everyone for a great job. To win the first tournament of the season says a lot for how far we've come so far. This was definitely a team effort with 3 players (Sarah, Samantha, and Jessica) sharing top scorer honors in the various games. That shows you how well balanced the team is becoming when a different player picks it up in each game. And a special congratulations to Jessica for being selected to the All-Tournamement Team. Great job Jessica and outstanding job everyone. Another outstanding game ladies. You started slow, leading by 8 at the half. But you really picked it up in the 2nd half, outscoring St. Peter 32-11. As usual, everyone made significant contributions, either by offense, defense or both. We have the Christian Brother's Tournament coming up next so let's work hard and be prepared. Take care ladies and thanks again for the hard work. Nice way to start the season ladies. Everyone contributed in this win with three players (Samantha, Jessica, and Crista) combining for 19 of the 33 points. So now let's carry this into the next game against St. Peters. Take care everyone. It was a tough decision but we have the team established. A number of very talented players tried out and it was a hard decision selecting just the right combination for this year's team. Check over in the roster section to be the 2003-2004 Varsity Basketball Team. If you would like to see the complete PAL Schedule and information, click on the above header to be transfered to the site.